April 15, 2019, 5:00 p.m.
It’s April 15: the deadline to file income taxes. Many taxpayers won’t be doing it themselves. In the latest Economist/YouGov Poll, about half of respondents who file tax returns say they rely on someone else – either an accountant or a friend – to file for them, while for those who do their taxes themselves, tax filing software is much more common than using paper Internal Revenue Service paper forms. Americans generally never like paying taxes, but this year the new tax law may not be helping. 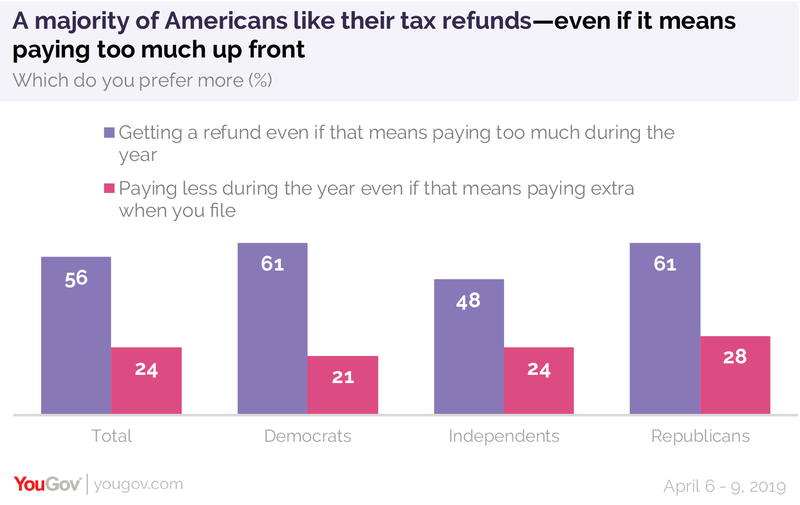 There is a bipartisan preference for how to pay: Americans – Democrats and Republicans – are at least twice as likely to prefer paying more during the year and receiving a refund as they are to pay less and perhaps owe the government on April 15. And that’s why so many American taxpayers are not especially happy with the new tax law. 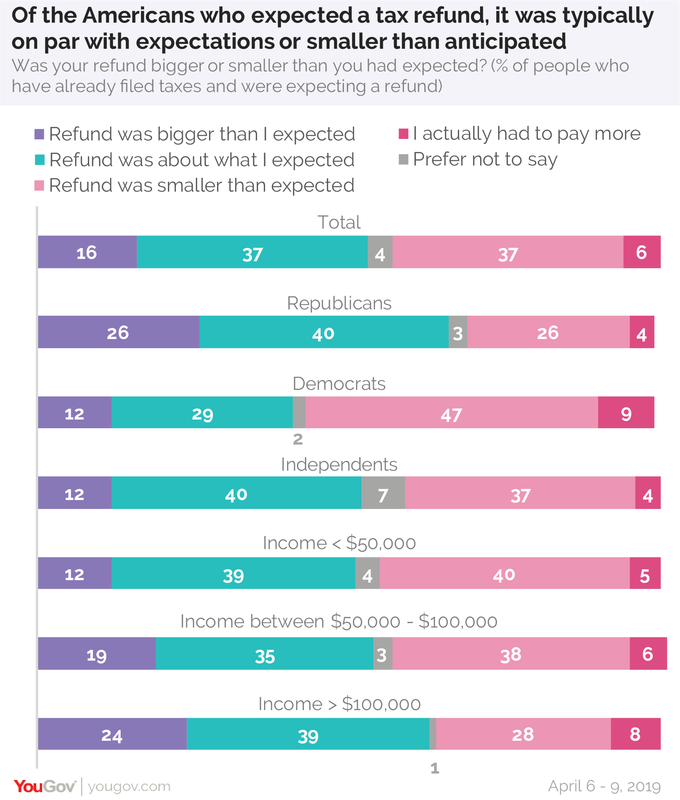 Nearly half, 48%, expected a refund, and for half of Democrats and a quarter of Republicans who thought a refund was coming, the refund they are getting is smaller than they expected. Some who expected a refund had to pay more. Larger-than-expected refunds were more likely among those with family incomes above $100,000 than with those whose annual family incomes were below $100,000. Just 22% of those who filed say they paid less in taxes this year because of the new GOP tax law. While Republicans are happier about the law, just a third of them say they paid less this year under the new law than they would have paid under the old system. Only 15% of all those yet to file expect they will pay less this year because of the law. 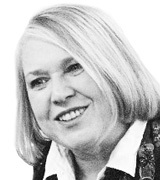 The new law has never been particularly popular, and it remains so today. Just a third support the law, while 40% oppose it. There isn’t much difference on this between those who have filed their tax returns and those who are still waiting to file. Nearly four in ten (37%) Americans believe they pay more than their fair share in taxes, while a similar number (35%) believe they pay roughly the right amount. But there is something that bothers American taxpayers more than the amount they pay. Close to half (46%) say they’re especially bothered by the idea that some wealthy people get away with not paying their fair share of taxes. As many Republicans are bothered by this concept (24%) as are bothered by the amount of money they personally pay (23%), though even more Republicans say it’s the complexity of the tax system (44%) that they dislike the most. Concern about what the wealthy pay is a belief as likely to be shared by those with incomes below $50,000 (50%) as by those whose annual family incomes exceed $100,000 (45%). Americans think it matters. They continue to want the President to release his taxes, which he still refuses to do. One in four Republicans agree. Even more Republicans want to see the Democratic candidates’ returns. 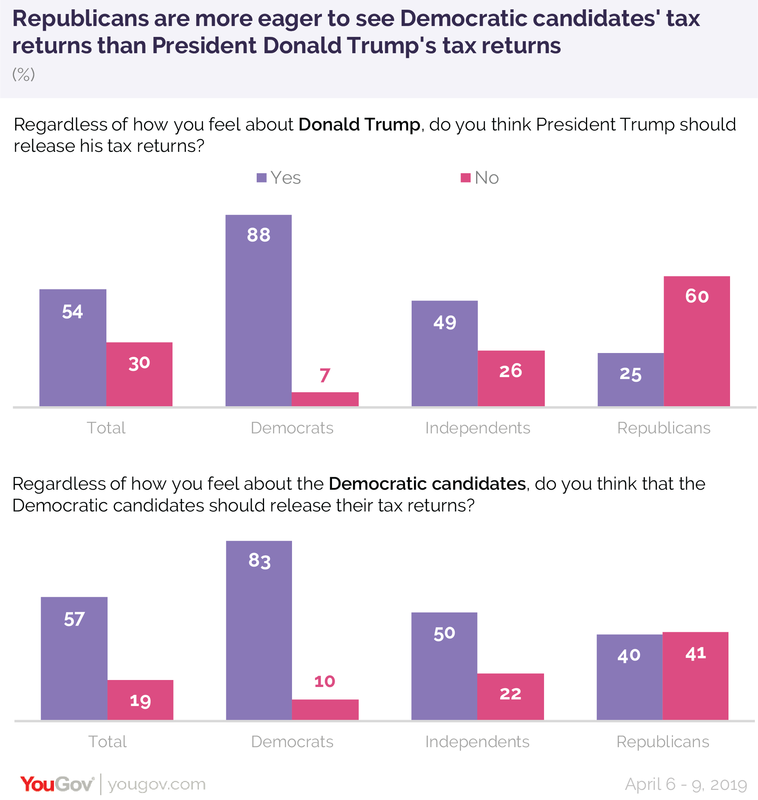 Democrats and independents favor the release of both the Democratic presidential candidates’ and the GOP President’s returns. By 48% to 37% overall, the public approves of the Democratic Congressional demand for the President’s taxes. Republicans think differently. Though 19% of Republicans approve of the Democratic demand to see the President’s taxes, 71% don’t.